Mineola's "Lost" Post Office Mural. "New and Old Methods of Transportation"
Mineola Post Office Mural, painted by Bernard Zacheim. In December of 2004 TE received a letter from a Mr. Loyd, a former Mineolan now living in New Orleans. 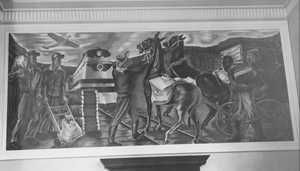 From his letter: [A feature in Texas Highways] "brought back memories of the mural in my hometown post office in Mineola, Texas. I could not find a listing indicating if the post office or the mural were still there, [it is likely] torn down or painted over. As a youth growing up there in the 40's & 50's I was always impressed with the painting. If I remember correctly, it depicted a train (Mineola was a terminal of The Texas & Pacific Railroad Co.) and agricultural scenes from the area. If anyone can advise if the post office and the mural are still there at the corner of Pacific & Kilpatrick Streets I would greatly appreciate it." "Thank you for your quick reply to my inquiry of the Mineola Post Office mural. I received an email from Mercy Rushing with the Mineola Chamber of Commerce, and she advises that the city now owns the old post office and is to be turned into a Museum of Mineola. The mural is currently being refurbished by the Son and Grandsons of the original artist named Zackheim. They plan an opening in May 2005." We thanked Mr. Loyd for this information and contacted Mercy Rushing at the Mineola Economic Development Department. She offered to send an image of the mural - which she did within the hour. Two images arrived - one in black and white and one in color. We forwarded them to Mr. Loyd. For whatever reason, the mural had been listed as "missing" in a brochure put out by the Texas Historical Commission. With eighty or so of the murals extant, it's easy to miss one or two. Perhaps the old post office had been in private hands. But all's well that ends well, and the mural has not only been "discovered" but is currently being restored. "Attached is the color version of our Mural for the Post Office, painted by Bernard Zacheim. This mural will be recreated by son, Nathan Zakheim of California. Mural recreation is being funded by the Meredith Foundation for $49,000.00, project expected to be complete by May 2005." - Mercy Rushing, CCD, Community/Economic Dev. Director , City of Mineola, TX.